Under the beating sun in Inverness, St Duthus visited Bught Park to take on Highland District amateur side Innes CI in their latest pre-season friendly on Saturday. The game ended in a pleasing 6-2 win for the Saints, leaving manager Stu Ross with plenty of positives to take into the next game and several of the team's young signings getting on the scoresheet. New addition Jake Lockett showed early signs of his threat to the CI defence and he created the Saints first chance when he held the ball up well before laying it off to Paul Cowie to shoot wide. Jamie Skinner was next to threaten when he broke free and nearly found the net with an attempted lob over Ross McDonald in the Innes goal. The Delny man's persistence paid off moments after when he won a 50/50 challenge with McDonald and broke free on an open goal to roll the ball into his path and tap home to make it 1-0. Also making his first appearance, Will Ross nearly put the Saints two ahead in the tenth minute when a looping cross from Paul Cowie found him inside the area but the midfielder headed just over. A goal did arrive, albeit at the other end against the run of play, just a minute later when Ross Gunn broke clear of the Saints back line and touching the ball forward he slid the ball through the grasp of an onrushing Steven Martin and over the line. Ross was back in the thick of the action soon after when his incisive pass found Lockett and the Lochinver man rattled the crossbar with a powerful effort. Lockett struck again after good work from Finn Chainey but his lobbed effort flew just over. Lockett finally notched to put the Saints back on top after receiving a pass from Ken Morrison, turning well before turning the ball beyond McDonald. The Saints extended their lead on the twenty minute mark thanks to a good goal from Ken Morrison, as he bagged his first for the club. Collecting a defence splitting pass from Paul Cowie, Morrison showed great composure to tuck the ball underneath the Innes keeper to make it 3-1. The floodgates appeared to be open as Jamie Skinner netted his second of the afternoon on 25 minutes to make it four. Weaving between two Innes defenders, he rounded off a great piece of play by dragging the ball past McDonald and slotting it home. Referee Bobby Urquhart awarded Innes a penalty for handball on the half hour mark and Gary Calvert duly reduced the deficit from 12 yards. Any buoyancy the home side had taken from their goal was quickly decreased when on 32 minutes Martin dealt with a brief spell of pressure from the home side, catching a volley from ten yards to thwart the home side's first chance to score since their first goal. As the first half drew to a close, Finn Chainey threatened with a series of runs, forcing a save at the second time of asking after cutting along the byline. The last chance of the half fell to Skinner who missed out on a first half hat trick as he struck the side netting from 20 yards. The second half began with a flurry of substitutions and within ten minutes the Saints had gone 5-2 up. 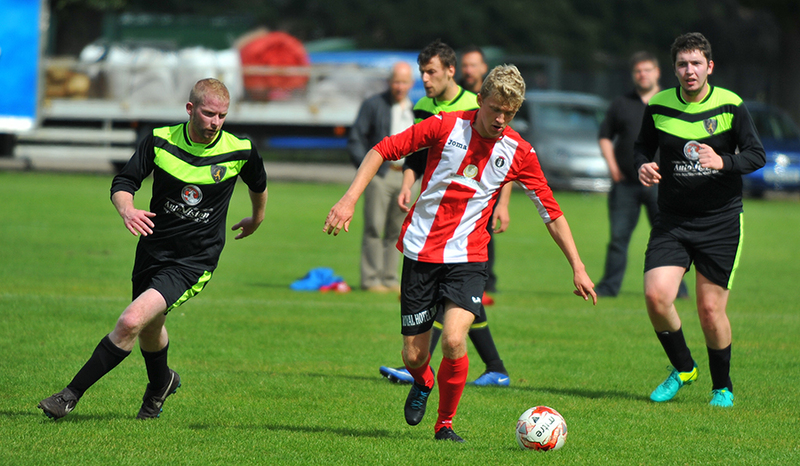 A looping Skinner cross from the right flank reached the head of Chainey who nodded the ball into the six yard box for the Saints' Trialist striker to head over the keeper and into the net. Substitute goalkeeper John Allan handled some second half pressure from Innes well but could only watch as a chance on the hour mark rolled past his left hand post. At the other end substitute Duncan MacKenzie looked in lively form as he teased the home defence. A clever run into the box with fifteen minutes to go saw the Dingwall man bear down on the Innes keeper and when it seemed almost inevitable that the sixth goal of the afternoon had arrived, the winger's effort somehow flew across the face of goal and away to safety. MacKenzie made amends under a minute later to make it 6-2 when he finished a chance close in to McDonald and the ball rolled into the far corner of the net. Lockett offered the last chance of the match with an effort from outside the box. The game ended with the Saints four goals to the good, completing a solid performance in all areas of the park. The match proved a good exercise ahead of their Monday night trip to Dingwall's Jubilee Park to meet Highland League side Fort William, which should certainly prove to be a much sterner test. Match Pictures courtesy of Graeme Webster.